Ibiza town's twin upmarket marinas, Botafoch and Ibiza Nueva, are home to luxury cruisers of the rich and famous, and high end bars, restaurants and clubs like Blue Marlin, Lio and Pacha. The yacht marinas on the other side of the port, Marina Botafoch and Ibiza Nueva, are graced with the floating palaces of Ibiza's jet set regulars, who migrate here faithfully at the start of each summer to keep their rendezvous with the most famous nightlife in the Med. We can really recommend a stroll around the quays and jetties of the marinas. Some of the biggest floating pleasure palaces you have ever seen are berthed in Ibiza (often with a scantily-clad sun worshipper adorning the cushioned decks!). At both marinas there are some excellent restaurants and cafés from which to enjoy the view and the atmosphere. Designer boutiques offer great shopping opportunities. Right next to the marina are some of the best hotels in Ibiza Town. At the end of Marina Botafoch you just have to walk across a road to be at the beautiful beach of Talamanca with a good choice of hotels - here you have the best of both worlds, quiet beach life and living near the action of the town. From the jetty opposite the Ibiza Corso Hotel & Spa little ferries connect the marina to the centre of Ibiza town. At night both marinas get busy, after dinner people meet in the many bars, for a gin and tonic and a first pre-club dance. Others enjoy a game in the Casino de Ibiza in the, a gourmet show-dinner in the sophisticated night club Lío or an unforgettable evening in the venue Heart, which - in partnership with the Cirque du Soleil! - fuses gastronomy, performances, live music and club nights. After midnight clubbers then flock to Pacha, the famous super club of Ibiza town, and dance the night away. Why not charter a boat yourself? 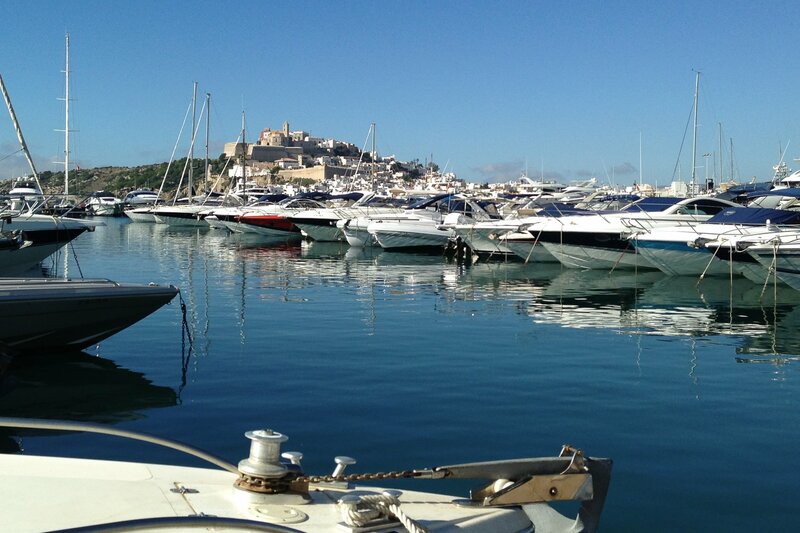 This is much less pricy then you might think - see our page Boat Charter on Ibiza.